Are you having difficulty reaching your favorite bottle of wine in your wine racks? If your wine racks are taller than you are, and you find yourself standing on a chair or any platform to reach the bottles stored at the topmost section, then you need a wine cellar ladder! 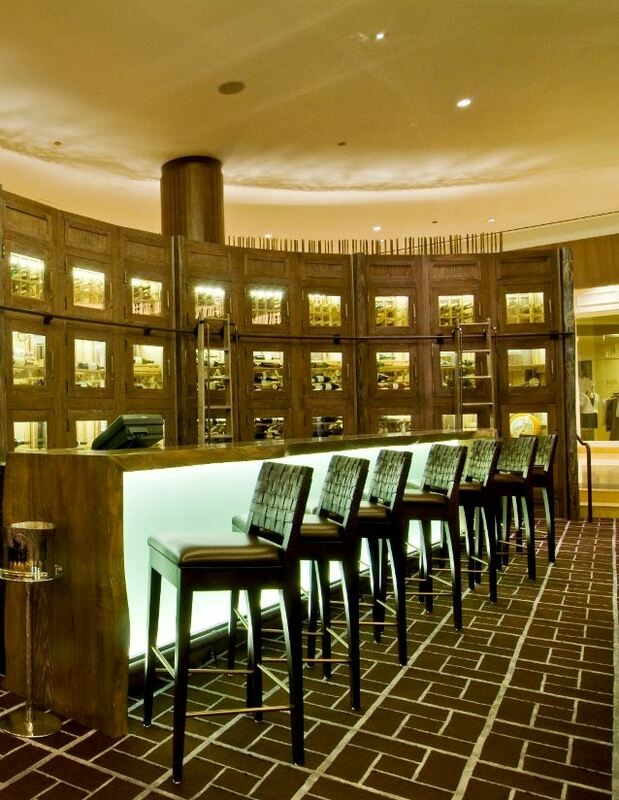 At Harvest Custom Wine Cellars and Saunas, we want to provide our clients easy access to their favorite vintages. Check out the different ladder styles we offer for our clients in Baltimore. Grabbing your favorite wine from the topmost section of your tall wine racks is not easy without the help of a ladder. 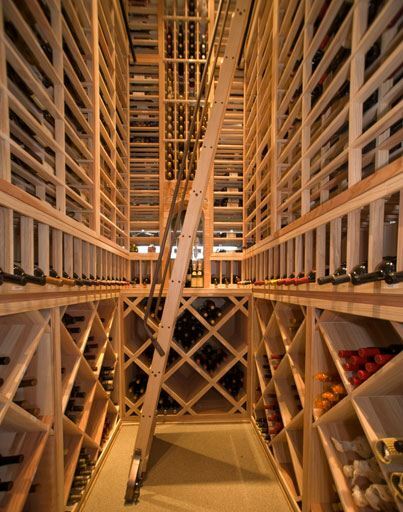 More wine room builders in Baltimore are incorporating wine cellar ladders into the racking design to prevent their clients from having a difficult time getting wines from their wine racks. Moreover, a ladder also adds a functional feature to a wine room. This affordable accessory is growing in demand in both residential and commercial wine cellars. 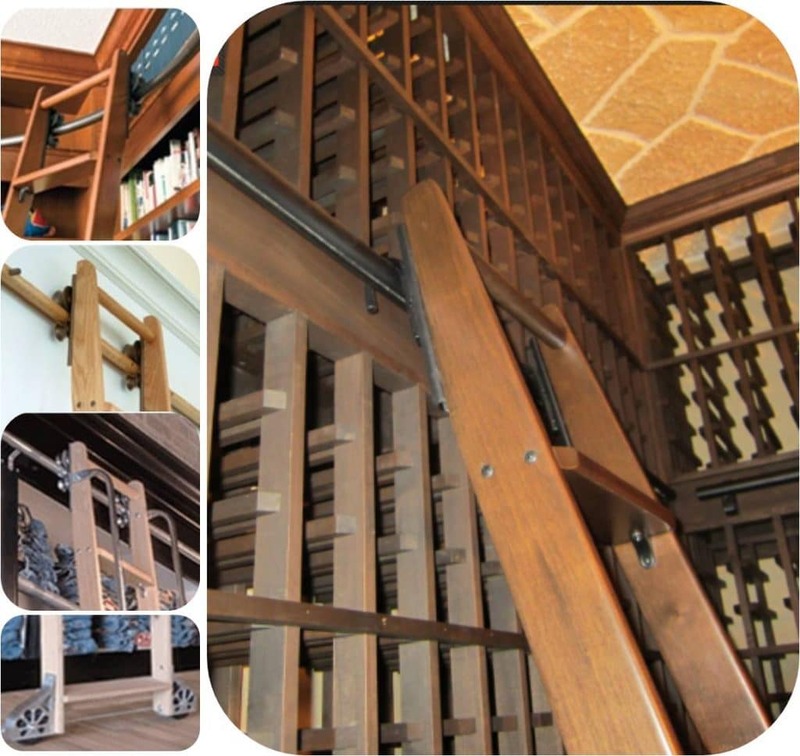 You may choose from two styles of rolling library ladders: straight or bent wine cellar ladder. The straight ladder is ideal for wine cellars with single-deep wine racks. 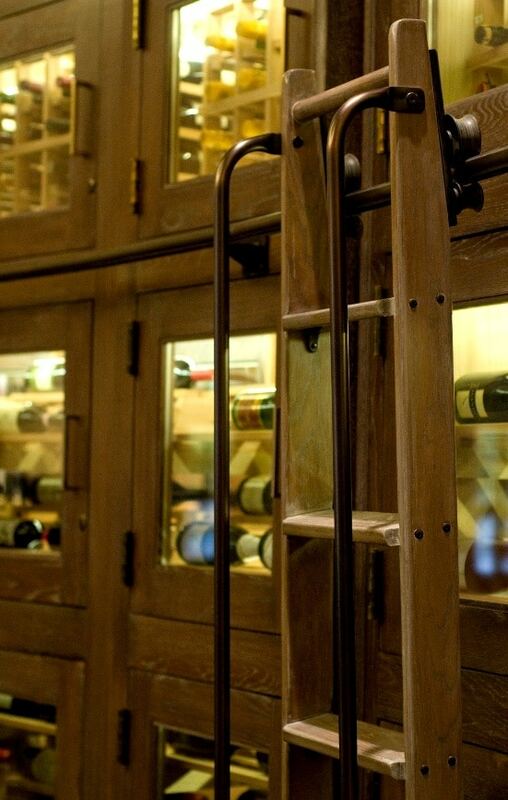 We recommend the bent ladder for wine rooms with double-deep racking, cabinets, and tabletops. Customization options allow you to choose the best components for your wine cellar ladder. In Baltimore, we had clients who wanted to customize their wine cellar ladder so they could select what material, finish, and functional features to use. Wood has been a favorite material in manufacturing wine racks and other pieces of furniture. Its earth tones add a classic appeal to your space. At Harvest Custom Wine Cellars and Saunas, we manufacture wine cellar ladders made from Mahogany, Red Oak, Alder, Cherry, Maple, and Walnut. Some of them take stain well while some are naturally beautiful even when unstained. If you are not sure which material to choose, we will help you select the best type of wood for your needs. Metal is known to complement any existing décor. Whether you have a traditional or contemporary style wine cellar, a metal wine cellar ladder is a good option. It has a sleek appeal and is known for its sturdiness, high resistance to warping, and low maintenance. 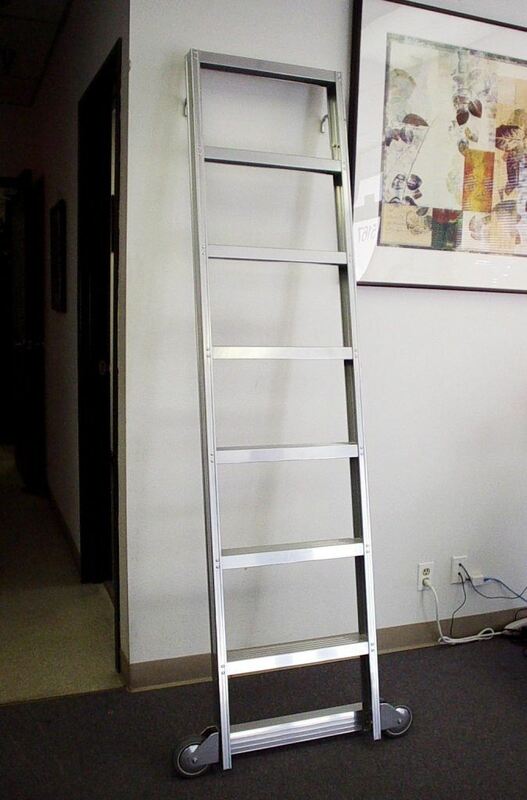 You may request for a full stainless steel ladder. It is a modern way to access your wines. Moreover, it is durable and easier to maintain than ladders made of wood. To maximize your convenience and add more visual appeal to your wine cellar ladder, we offer various components to suit your requirements. These include the wheel housing, hardware finishes, handrails, brackets, assemblies, and a non-slip tread. The standard wheel housing for the wine cellar ladder is the contemporary wheel assembly, which includes a brake and an exposed wheel. Cast sunburst pattern is a favorite design for the wheel housing because of its elegance. When choosing hardware finishes, you’ll want to match the components with your existing wine racks and your ladder. The most common finishes used by Baltimore designers and builders are metallic and enamel. Whichever option you choose, it will add an elegant look to your wine cellar ladder. Handrails are usually not included in a wine cellar ladder. However, you may opt for handrails if you want to give yourself a grip while you climb. We have handrails designed to be flush with the sides of the ladder and those that can be extended beyond the ladder top. You may choose to add a handrail on the right, left, or both sides of your wine cellar ladder. With a wide range of styles to select from, consulting an expert like Harvest Custom Wine Cellars and Saunas will benefit you. Just let us know the style you prefer (custom, traditional, or modern) to make sure that it suits your needs. The brackets are used to attach the ladder rail to the wine racks. The kind of bracket will depend on what type of assembly to be used. The hook assembly is used if you want your wine cellar ladder to be removed from the track. The roller assembly, on the other hand, is designed for ladders that are to be affixed to the ladder track permanently. Moreover, it also allows the owner to fold the ladder when not in use. The track system is dependent on the shape and design of the racking. It can be designed for just one wall or with curved corners, which allow the ladder to be moved with convenience from one wall to another. You can access your bottles stored beyond your reach safely by adding a non-slip tread to every step of your wine cellar ladder. We always offer this functional wine cellar ladder feature to our clients to prevent slipping. Whatever your needs are, we will help determine the most suitable type of wine cellar ladder for your home or commercial establishment in Baltimore. If you have any questions, please do not hesitate to contact us at 804-467-5816!